Recently I was given a book authored by one of my clients, Tom Metz. 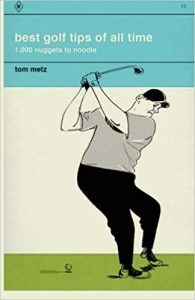 The book is titled “best golf tips of all time” and is a compilation of the as he stats “1,000 nuggets to noodle.” This book is absolutely hilarious as he began the project as a joke for his friends and then decided to share it with the world. Want to purchase your own copy of this gem?